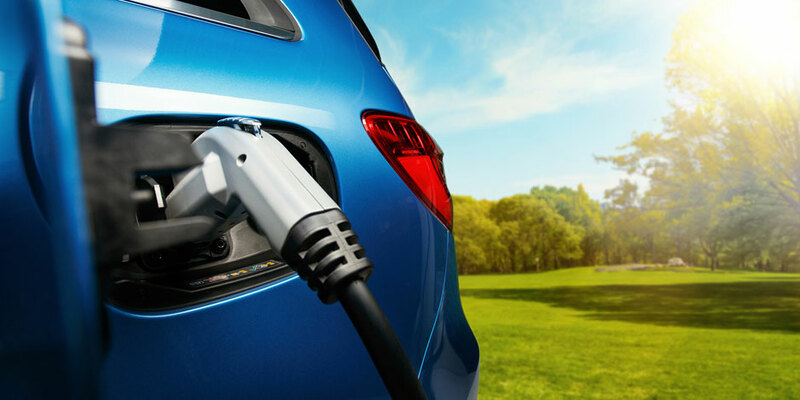 Powered by an expertly crafted electric motor and battery pack, the 2016 Mercedes-Benz B-Class goes the distance without a single drop of gasoline. Featuring responsive handling technology, generous interior space, and convenient amenities, the B250e is a sporty hatchback with plenty of real-world staying power. Take the Mercedes-Benz B-Class for a test drive at Mercedes-Benz Brampton, located in the Greater Toronto Area near Orangeville, and learn about the benefits of our Preferred Customer Program! Developed in collaboration with TESLA motors, the B250e hatchback’s all-electric powertrain propels it from 0 to 97 kph in a breezy 7.9 seconds. Meanwhile, the 28-kilowatt lithium-ion battery pack houses enough power to keep the Mercedes-Benz B-Class going for 140 kilometres on a full charge. All in all, the B-Class nets an electric-car efficiency rating equal to 2.8 city/2.8 L/100 km. The interior is thoughtfully designed to extend the B250e hatchback’s range as much as possible. With the touch of a button, you can increase the battery’s max charge level, giving you up to 27 extra kilometres of range whenever you need it. Built to cruise, the Mercedes-Benz B-Class comes standard with a front-wheel drive system, which works in accordance with the Electronic Stability Program and Electronic Traction System. The 4-wheel independent suspension relies on MacPherson struts in the front, and a 4-link design to the rear to provide quick feedback and adaptability. All the while, the advanced electromechanical power steering system makes easy work of tight corners, and provides excellent low-speed maneuverability. Whether you’re weaving through the Greater Toronto Area, or zipping down an open stretch of highway, the B250e is designed to keep the pace. Energetic through and through, the B250e hatchback offers a clear emphasis on driver comfort and enjoyment, as well as plenty of headroom and legroom across the board. The cockpit and cabin boast trademark Mercedes-Benz charm with eye-opening accents and details. The circular air vents with aluminized rings, 3-spoke multi-function steering-wheel, well-organized controls, and Sail Pattern trim reaffirm the sportiness of the B-Class. The 60/40-split-folding rear seats can be folded down for a maximum cargo capacity of 1,455 litres, or left in place for a roomy 612 litres of storage. What’s more, you can remotely unlock each of the B250e hatchback’s five doors with standard KEYLESS-GO® for hassle-free trips to the grocery store, park, and more. Adding excitement to every drive is a freestanding 177.8-millimetre color display, which comes paired with a console-mounted controller. In addition to the multi-function steering-wheel, the 177.8-millimetre display allows for quick access to Bluetooth®* and audio controls. The standard Garmin® MAP PILOT® is also managed via the display and controller, and includes convenient maps, voice control, and 3D viewing. Decking out your 2016 Mercedes-Benz B-Class hatchback with top-notch infotainment features is a cinch. Advanced voice control, a 203.2-millimetre freestanding display, COMAND® navigation, and a harman/kardon® Logic 7®** sound system are just a few of the available tech features for the B-Class interior. Reinforced with high-strength steel and energy-absorbing crumple zones, the B250e offers advanced protection for Orangeville drivers. The exterior includes LED Daytime Running Lamps and taillamps for greater visibility, as well as an auto-on rear-window wiper. The moment you open your door, the illuminated front door sills ignite with a soft white light for an easy entry or exit. On the road, 9-way airbag protection and 3-point seatbelts with ETDs offer greater peace of mind, while adaptive braking technology and Brake Assist work to provide the correct amount of brake force in every situation. 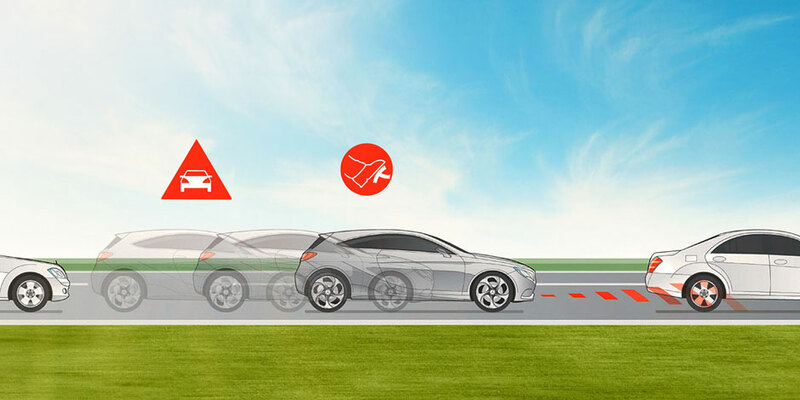 Standard ATTENTION ASSIST® comes in handy on long drives by monitoring driving behaviors for signs of inattentiveness, while COLLISION PREVENTION ASSIST PLUS® scans the road ahead for probable collisions. Sporting a 132-kilowatt electric motor, the B250e Hatchback generates 174 hp and 250 lb-ft of torque. The exterior features a functional 5-door design and 10-spoke wheels, while the interior boasts must-have conveniences, such as power front seats with memory, Mercedes-Benz mbrace® Connect, dual-zone climate control, and dual USB audio ports. 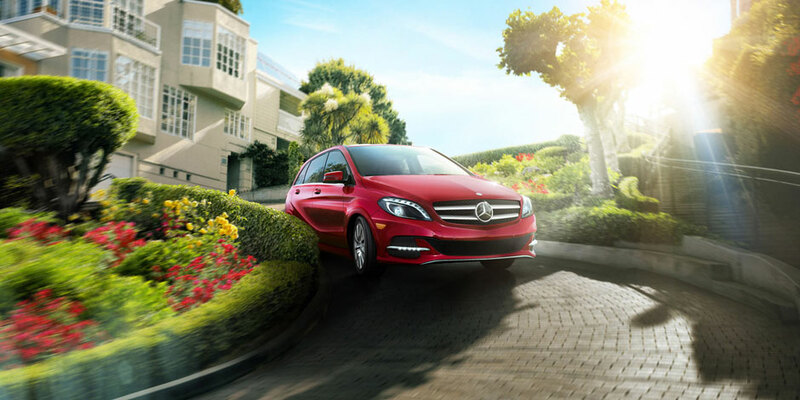 Discover the B-Class Hatchback in the Greater Toronto Area! The 2016 Mercedes-Benz B-Class offers spectacular range, accompanied by fluid handling, proactive safety features, and in-demand technology. To learn more about this all-electric hatchback, contact Mercedes-Benz Brampton from 9 a.m. to 8 p.m. Monday through Thursday, from 9 a.m. to 6 p.m. on Friday, or from 9 a.m. to 5 p.m. on Saturday. Or, get the process started by applying for financing, or configuring your finance details with our handy payment calculator. Drivers in Orangeville and beyond are welcome to visit our dealership, located at 10 Coachworks Crescent in Brampton, for a closer look! **harman/kardon and Logic 7 are registered trademarks of Harmon International Industries, Incorporated.